One of my goals for 2012 was to read more. I realized that ever since high school, I hardly ever read on my own. I could use the excuse that I was already spent the majority of my time reading required books for school, but honestly I think that’s just a lame cop out. There are plenty of people out there who read on their own and still get their schoolwork done. But…I was not one of them. Now sit me down with a Harry Potter book and I’ll shred that to pieces in a matter of days. I used to read A LOT as a kid. I devoured the Little House series, Roald Dahl books, Gary Paulsen’s Hatchet novels, and absolutely loved Bridge to Terabithia. But then other things became more important. Like, everything else in my life became more important. Don’t get me wrong, it’s not like I never picked up a book and read on my own ever. But, after I graduated from college, I realized that I only read a handful of books on my own each year and I knew that my 8 year-old self was looking down on me in disappointment. Over time and with no help from Facebook and high-speed internet, I had acquired the attention span of my 3-month old nephew. Instead of reading, I used to play a lot of Spyro the Dragon on my PS2. How could I resist a video game about a cute fire-breating dragon? And I’m happy to say that I read more books on my own last year than I have in quite awhile. You know, there are some perks to not being in college anymore. Loan payments and unemployment not included. My thru-hike obsession and my re-discovered love for reading came together at the perfect time. Last April, I made my first AT reading purchases. I bought Bill Bryson’s, A Walk in the Woods and the 2012 Thru-Hiker’s Companion. Bryson’s book was a great read and I enjoyed reading about their adventures and the history and ecology of the trail; however, I wanted something more. A more complete thru-hiker’s experience. A female perspective. I landed upon Jennifer Pharr Davis’ account of her 2005 thru-hike, Becoming Odyssa. This book is about her first thru-hike and not her more famous record-breaking speed hike. Since I was at the beginning of my thru-hike “research,” I really loved Davis’ book and it really made me solidify my decision to hike the trail. Again, I was said in one of my earlier posts, Appalachian Trials, by Zach Davis is a must-read for anyone thinking about thru-hiking in the future. Honest, funny, and extremely helpful, both Miles and I read this one. The Ultimate Gear Guide, by Andrew Skurka was a book that my dad got me for my birthday last year. There’s a lot of information packed into this little book and not only about gear for the AT, but for all different climates and hiking adventures. Right now, I’m in the middle of reading three books. I’ve got two months to finish them before I leave. Guess this will be a good test of my attention span! I’m about halfway through AWOL on the Appalachian Trail, by David Miller, who also writes The A.T. Guide, which he updates every year for a new group of thru-hikers. AWOL’s book is a great, first-hand account of his 2003 NOBO thru-hike. Plus, AWOL’s guide is amazing. 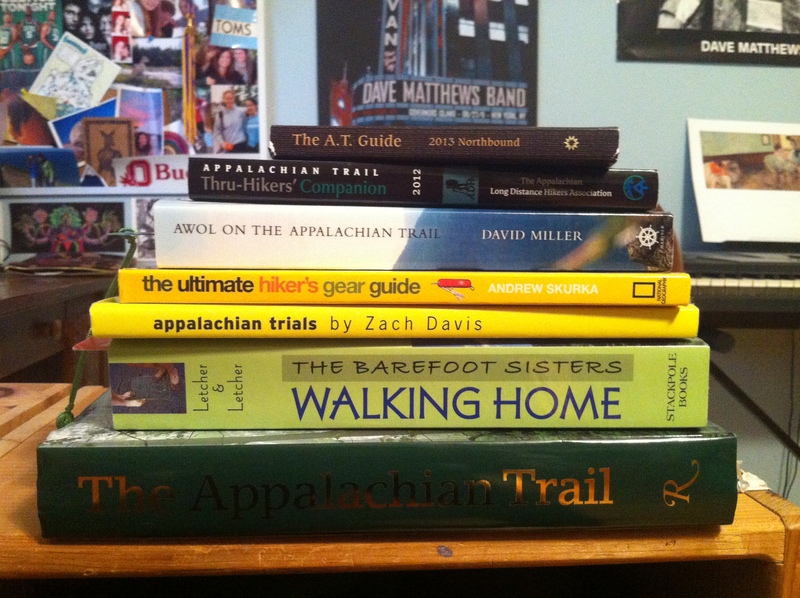 While I had picked up the 2012 Thru-Hiker’s Companion last year, it doesn’t compare to AWOL’s guide in my opinion. The Barefoot Sisters Walking Home written by sisters Lucy and Susan Letcher, is a great book for several reasons. It’s about a thru-hike from the perspective of two women. They’re from Maine, and not far from where I grew up. They did a yo-yo, where they hiked from Maine to Georgia and then turned around and hiked all the way back to Maine immediately after they finished their SOBO hike! And if they couldn’t get any more awesome, they hiked the entire trail BAREFOOT. I don’t think I need to say much more about this book to make you want to read it. It’s a long book and I’ve just started it, so hopefully I finish it in time before we leave on our own thru-hike. And the last book that I’m reading at the moment is the simply titled, The Appalachian Trail. Written by Brian King, this book came out at the end of 2012 in celebration of the 75th anniversary of the Appalachian Trail. I’m a huge history nerd, so I was really excited when my dad surprised me with this book for Christmas. The book mainly covers the history of the trail from its inception in the early 20th century by Benton Mackaye up to the present day and the Appalachian Trail Conservancy’s work in obtaining and maintaining tracts of the trail. It also features a ton of beautiful photographs documenting the trail’s history and a section at the end with pages of photos from each state along the AT. If you want to learn more about how the idea of the AT came about and how that vision has evolved over time to create the trail we know today, I’d suggest this nice large addition to your book collection. This book has also sparked the idea in my head to do a little more research of historical spots along the trail. I’ll see what I come up with. The trail passes through 10 of the original 13 colonies, is directly connected to the Civil War, and even has connections to the Underground Railroad. History and hiking together in one adventure. Could it get any better? Yeah, well I suppose it could be, but I don’t think it could get any sweeter than that for me. The Appalachian Trail itself is a part of our history after all.